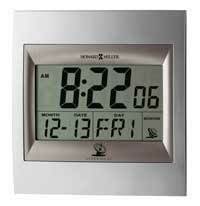 Atomic Alarm Clocks with LCD displays with day / date functions. These atomic alarm clocks are radio controlled by receiving a radio signal from the NIST that allow them to set themselves for Daylight Savings Time automatically. Most selections offer a display that will illuminate when you touch a button at the top of the clock so you may see the time in the dark. Free Shipping on all Howard Miller Alarm clocks! These alarm clocks will set automatically by an AM signal transmitted from Fort Collins, CO. All atomic alarm clocks are digitally controlled.